Kinect-supported (or sanctioned) cussin' was introduced in the FIFA and NBA 2K series last year, but on the Xbox One, both games have stepped up their penalties if you can't keep your potty mouth under control. 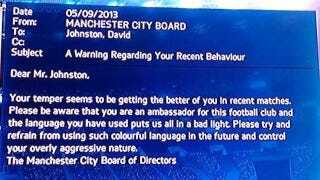 In FIFA, you'll get a nastygram from your club's ownership, even. Deadspin noticed a couple of users who were surprised to learn their Kinect 2.0 sensor on the Xbox One is just as alert as regular Kinect was last year in FIFA 13. However, last year the filth-flarn-flarn-filth would only result in a passive-aggressive scolding from commentator Martin Tyler. In 2012, the FIFA development team briefly toyed with the idea of handing out yellow cards, but had to back off that when they realized the potential for off-mike trolling by friends and little brothers in the room. NBA 2K's team also returns technical fouls to NBA 2K14—something they "fought hard" to include last year, though the league wasn't too thrilled about it being publicized. Neither is the guy getting T'd up by virtual Joey Crawford. At least he didn't get a technical for laughing.